This easy juicy slow cooker turkey breast recipe has herbed butter with hints of garlic and onion. Finished in the oven to get the crispy golden skin this recipe is perfect for those who don’t need the entire bird for their Thanksgiving celebration or those who only want the breast meat. This recipe for slow cooked turkey breast is very juicy and tender, but you also get the crispy golden skin as if you had roasted it in the oven. 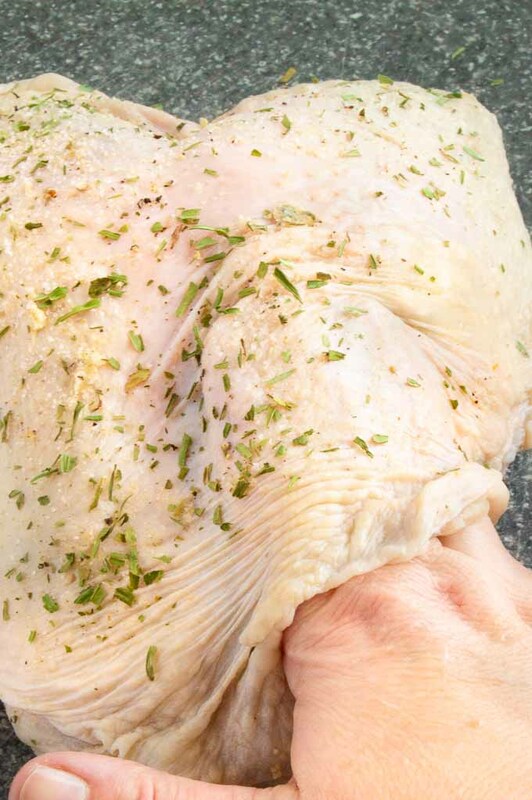 The turkey has a seasoned butter full of all of the flavors of traditional turkeys like onions, garlic and sage but made without using the oven. In our house over the years the amount of side dishes has pretty much taken over our Thanksgiving dinners and oven space is always at a premium so I’m always looking for ways to make Thanksgiving recipes not using the oven. It’s nice to have an option for thanksgiving turkey that doesn’t require the oven. This slow cooker turkey breast is basically hands off so you can spend the extra time making all of the side dishes your family loves at thanksgiving. How to get a juicy turkey in the slow cooker? How long to cook a turkey so it doesn’t dry out? What temperature is the turkey done at? How you can save a dry turkey? There are a couple of tricks when cooking the turkey in a crock pot. Most cooking in the slow cooker is done down in the liquid but if you do that with the turkey you will end up with meat that falls off of the bone as you are lifting it out. While that is fine for weeknight cooking of turkey, you don’t want that for Thanksgiving. 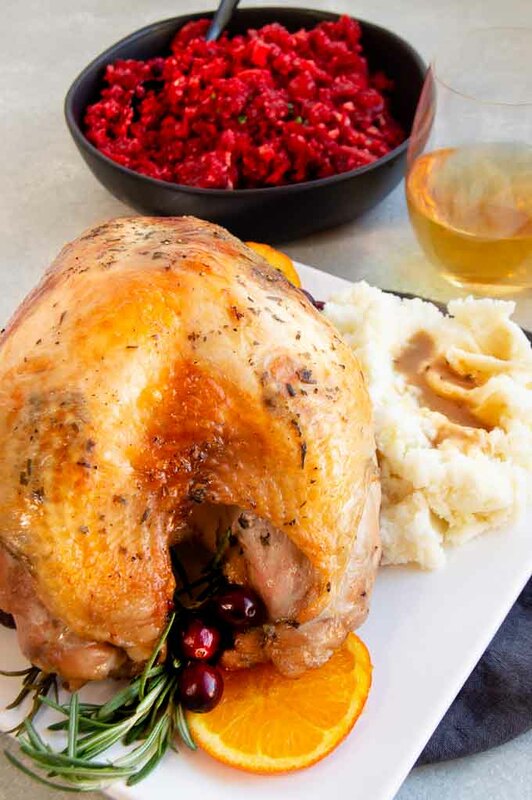 To achieve a gourmet photo worthy turkey on your family table you’ll want to create a shelf to cook the turkey on so it doesn’t sink down into the liquid. Next you’ll make a heavily seasoned butter with a softened butter and all the herbs that make you think of thanksgiving. Poultry seasoning, garlic, onion and salt season the turkey to perfection. Create a pocket underneath the skin to add both flavor to the turkey meat and to help guarantee a moist juicy tender turkey breast meat. After seasoning the turkey breast generously with more salt pepper and herbs on both the top and the bottom place the turkey in the crock pot on top of the shelf. Add a little wine or stock to the crock pot/slow cooker then cover. Cook on high for a couple of hours, then reduce the heat to low to finish. For a 4 pound bone in turkey breast I suggest cooking it on high for 2 hours, then reducing it to low for 5-6 hours. 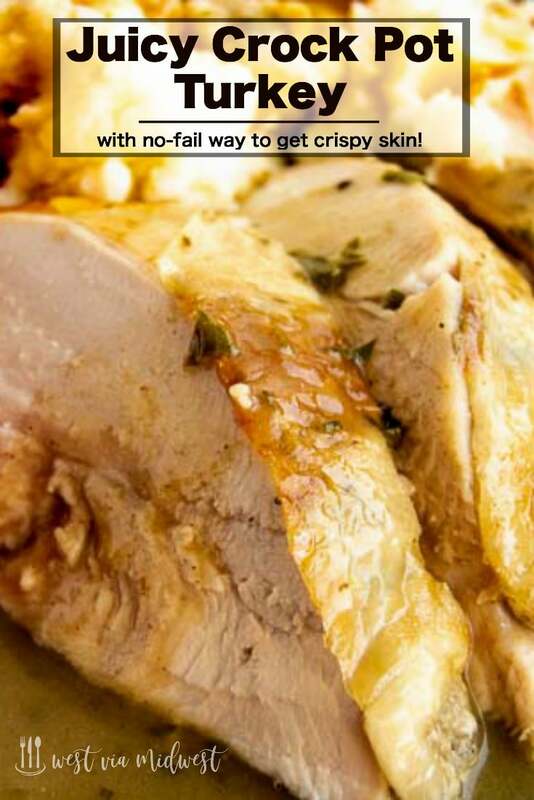 Once the turkey is done you’ll want to broil the turkey for just a few minutes to get a crisp golden brown skin. What temperature is turkey done? Turkey is safe to eat when it reaches 165°. I use a simple handheld thermometer and insert it into the thickest part of the turkey breast to measure it. You’ll want to make certain to avoid touching the tip to any bone so you get an accurate reading. You cant have Thanksgiving turkey without a great gravy. Gravy is also the way you can save a turkey if it seems dried out. If you cook to the 165° and use the butter I promise you this turkey breast in the slow cooker will not be dry, but sometimes things happen and you cook it too long. 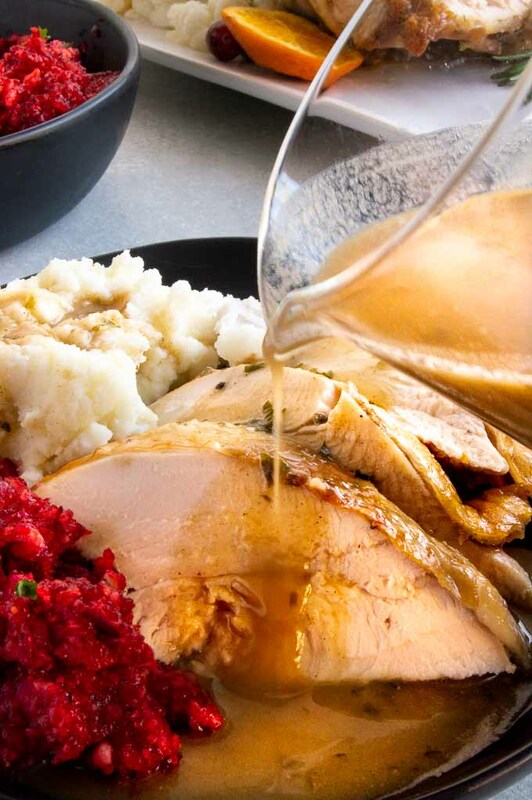 This gravy is made with the same spices and seasonings you slathered the turkey in so its an beautiful extension to the wonderful flavors in the turkey. The gravy is a lighter gravy with just a small amount of flour in it to thicken it and made with the juices that are leftover in the crockpot so they are filled with super flavorful bits. 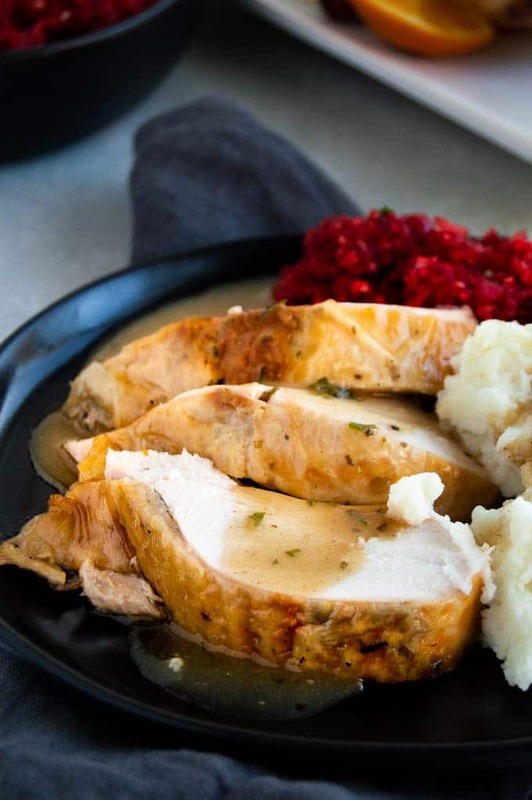 How to make delicious flavorful turkey gravy? PRO TIP: The number one tip in making delicious turkey gravy is to use all of the leftover juices and liquids left in the bottom of the slow cooker. Strain out the solids leaving you with an intense flavorful liquid. Add flour and let it cook for a few minutes until the butter and flour is fully integrated. Add the liquid to the flour/butter mixture stirring continuously until blended. Bring to a boil and let thicken. Serve over top of the carved turkey. Watch the video here to see how easy this is to make! 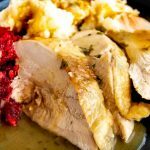 This easy juicy slow cooker turkey breast recipe has herbed butter with hints of garlic and onion. Finished in the oven to get the crispy golden skin this recipe is perfect for those who don’t need the entire bird for their Thanksgiving celebration or those who only want eat breast meat. 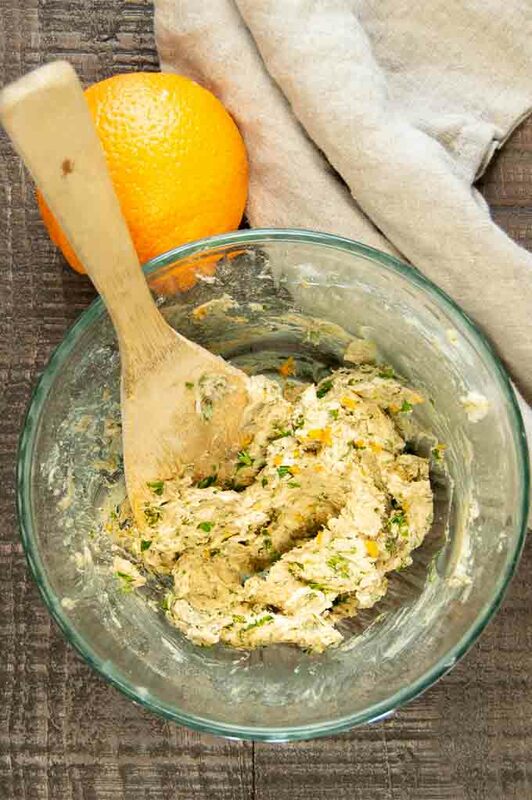 In a small bowl mix butter, poultry seasoning, garlic salt, pepper, onion powder and orange zest until well mixed. Rinse turkey, pat dry. 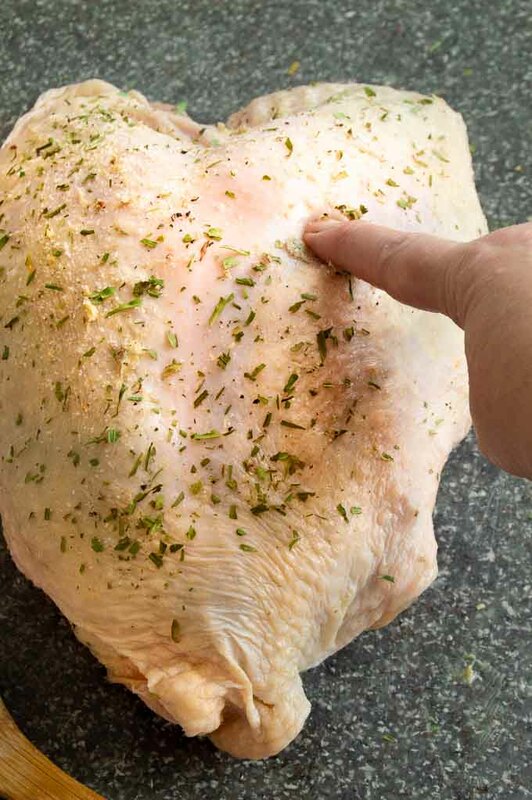 Using your fingers slide create a small pocket just beneath the skin coming up from the base of the turkey breast on each side up to the bone that runs across about 3" below the top opening. You will leave the skin attached all the way across to hold it in place. (see photo where I point to where to leave it attached. In the pocket, stuff butter inside. Then go from the top part of the breast and stuff butter down to where line is that skin stays attached to hold it in place. 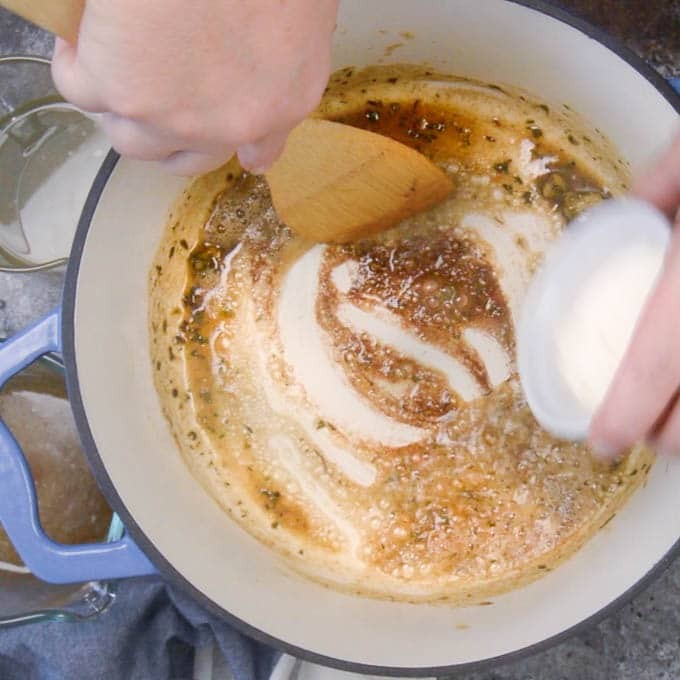 You will leave about 3 tablespoons of the seasoned butter for making the gravy after cooking. Season both sides of the butter stuffed turkey breast with salt pepper and tarragon. Cut the onions and garlic in half. 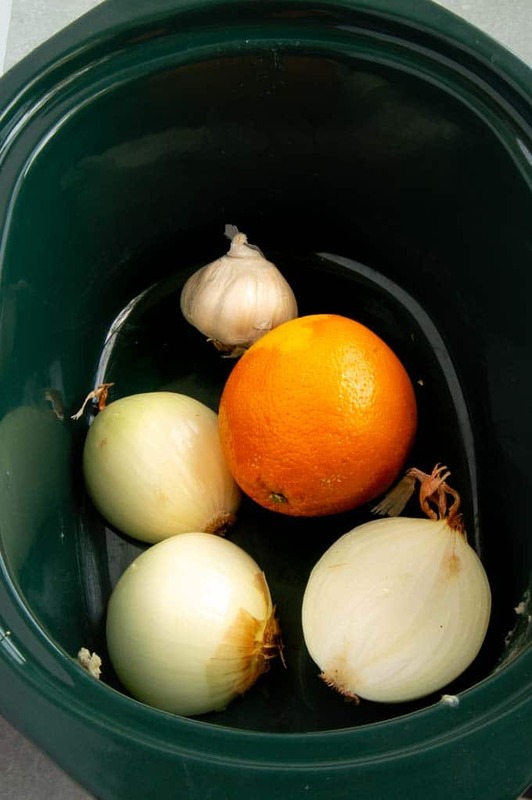 Place into the bottom of the crock pot along with the whole orange. Place the turkey breast on top of the shelf created by the onions, garlic and orange. Add 1/3 cup wine and 1/4 cup water to the bottom of the crock pot. Cook on high for 2 hours, then reduce the heat for for 5 hours for a bone in 4 pound turkey breast until the temperature using a thermometer is 165°. Once the turkey is done remove it from the slow cooker and place in the oven on broil for 5-10 minutes to crisp and brown the skin. *******Note****. watch the turkey very closely as on broil the skin can burn very quickly. Once it is golden brown, remove from the oven and cover with foil to keep it warm until ready to serve. 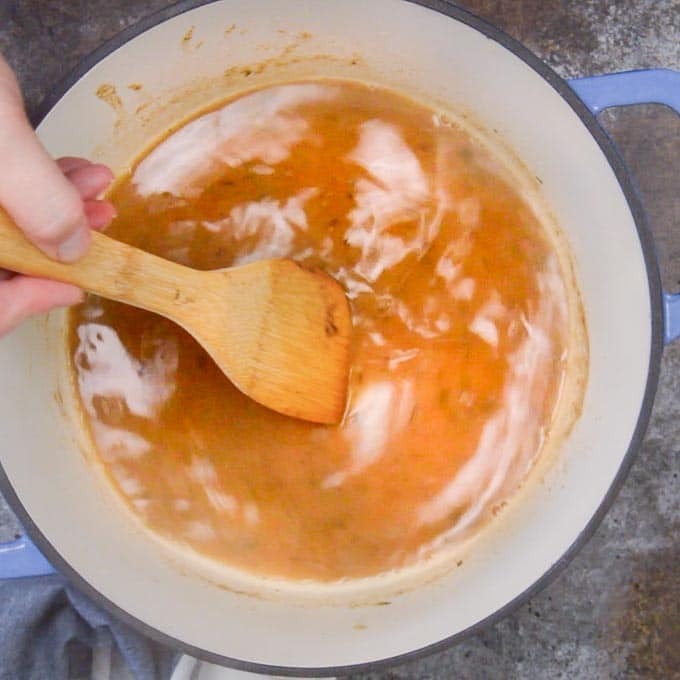 Make the gravy: Stain out the solids (onion, garlic, orange) from the remaining liquid in the bottom of the crock pot to a measuring cup. 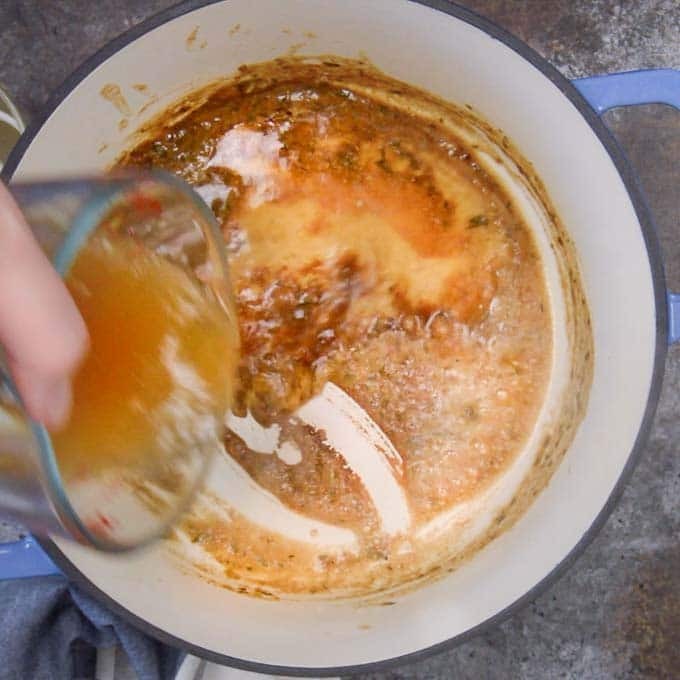 You want to get about 2 cups of liquid so add stock to achieve a total of 2 cups in your measuring cup. Using the remaining seasoned butter heat a small pan to medium high and melt the butter. (stirring constantly to avoid it burning.). Then sprinkle the flour over the top in stages to incorporate well and avoid lumping. 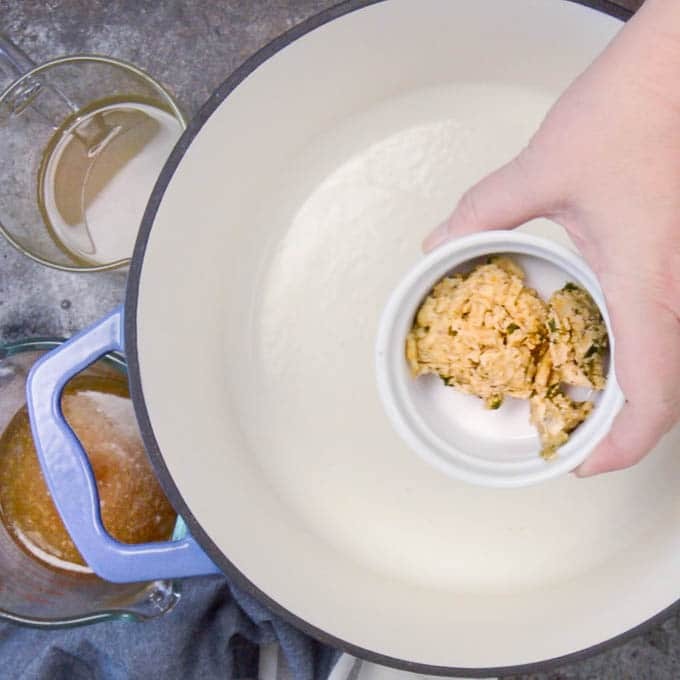 Once flour is well blended slowly add the liquid to the pan while stirring quickly to avoid lumping. Once the flour/butter is incorporated bring the gravy to a boil and stir until the gravy has thickened. Place in serving vessel and serve over top of turkey. You can absolutely use a de-boned turkey breast. The cooking time will be less. I suggest cooking on high for only one hours, then reduce the slow cooker to low to avoid it drying out. You will still Cook turkey to 165°. Love that this is made in the slow cooker! Looks so tender and delicious! I love the easy cleanup and that delicious gravy from the turkey juices in the slow cooker. Also, not hot kitchen from the oven being on all day! Wowza! That turkey looks so juicy and that gravy! Swoon! My sister in law just let us know that she sent us a smoked turkey for Thanksgiving, but I don’t think it’ll be enough. Just found my solution! This will be perfect and love that it slow cooks. Yes, to the butter! !